$3.5 million. That’s how much one Cat® customer expects to save in just one year by using onboard machine data to build a targeted training program for loader operators. This particular organization—which runs about 500 loaders globally—was fairly certain there was money to be saved by teaching operators new techniques for conserving fuel. But before any training commenced, the company captured more than a year’s worth of fuel consumption and idle time data from 16 machines equipped with Cat Product Link™. They used that data to establish improvement targets, then developed a set of best operating practices and launched a targeted training program. Operators had full access to the data so they understood where they were starting and could gauge progress as they learned. Within six months, the team had cut fuel use by .4 gallon per loader per hour and reduced idle time from 23 percent to 14 percent. Curious to learn how you can use data to optimize your training investment? 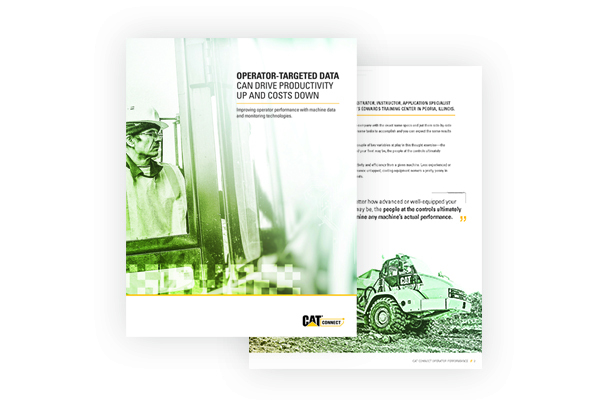 Get details in a new white paper from Caterpillar called “Operator-Targeted Data Can Drive Productivity Up and Costs Down.” Download it now. COST-REDUCTION PLAYBOOK: WHAT’S IN YOURS?